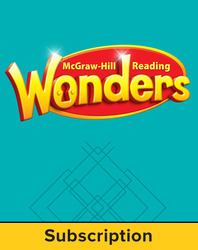 The Wonders Reading/Writing Workshop is a robust, concise teaching and modeling tool for close reading mastery with core reading and writing lessons all in one place. It includes Weekly Openers introducing the week's concept with photographs, interactive graphic organizers, videos and more; shared short complex texts; and Read About it? Write About It! integrated practice pages, all tightly connected to a lesson's essential question. The workshop answers the question, "What do I have to teach for CCSS success?" Available in print and fully-digital editions.